In a tweet, Kenneth Smith Ramos said the “ideal scenario” remains a trilateral agreement. Canadian and American officials have been working towards an Oct. 1 deadline as they try and hammer out an agreement on a handful of sticking points including dairy and Chapter 19 – one of NAFTA’s dispute resolution mechanisms. Prime Minister Justin Trudeau has repeatedly said he will defend the country’s supply management system and has said any new NAFTA deal must include a dispute resolution mechanism. Speaking to reporters in Saskatoon earlier Thursday, Trudeau dismissed the Oct. 1 deadline, saying Canada will not sign a deal that is not in this country’s best interest. 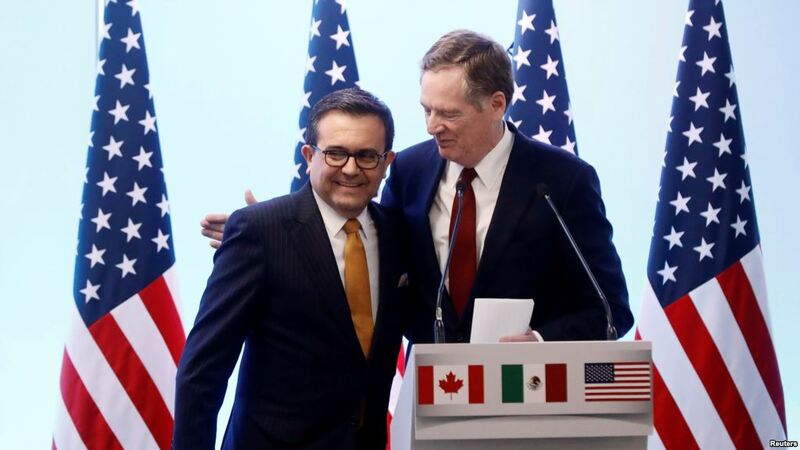 Oct. 1 was set after U.S. Trade Representative Robert Ligthizer wrote the U.S. Congress earlier this month to notify it a deal had been reached with Mexico. The letter specified that Congress would be presented with an agreement that included both Canada and Mexico. Congress has authorized American negotiators under its Trade Promotion Authority to secure a trilateral deal. Whether Congress is prepared to accept a bilateral deal remains to be seen. Any trade agreement reached will need to be ratified by the political bodies in all three countries. U.S. President Donald Trump has threatened to levy tariffs on Canadian automobile exports if a NAFTA agreement is not reached. He has repeatedly accused Canada of being “unfair” to the United States, particularly on the dairy file.